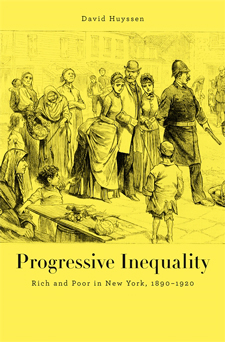 In the latest episode of the Urban History Association Podcast, Andrew Needham and Lily Geismer talk to historian David Huyssen about his new book, Progressive Inequality: Rich and Poor in New York, 1890-1920. (HUP, Amazon, Powell’s). Huyssen (pronounced “HYOO-sen”) questions the notion of the Progressive Era as one inherently defined by progress. In a book featuring the messy specifics of individual lives, he examines points of interaction between people of different classes in New York. In the interview, he ultimately concludes inequality is a choice that society makes. You can stream from this site or follow the link and download the mp3. Follow the jump for notes on the interview. Historian Gabriel Kolko, author of The Triumph of Conservatism: A Reinterpretation of American History, 1900-1916, died in May, 2014. Read his obituary in the NYTimes. Andrew Needham contrasts Huyssen’s book with Daniel Rodgers’ book Atlantic Crossings, on the transatlantic exchange of reform ideas at the turn of the century that reached their most robust implementation in the New Deal. Read the H-Net review here. Beverly Gage’s article on terrorism is available here. (pdf) Sven Beckert’s co-edited book on the American Bourgeoisie (with Julia Rosenbaum) is available here. Robin Kelley’s book on Thelonious Monk is available here. The firm of Alfred Winslow Jones, the first hedge fund, still exists. Jones’ Wikipedia entry is here. David clarifies a point he made on child labor laws in the interview. He indicated that child labor prohibitions were repealed in the 1920s, but notes more specifically that the Supreme Court struck down the first 1916 law against child labor as unconstitutional in 1918, and a subsequent effort to pass new anti-child labor legislation failed in 1924. Comprehensive federal child labor law wasn’t on the books until 1938, with passage of the Fair Labor Standards Act. Read the Supreme Court decision in Hammer v. Dagenhart, 247 U.S. 271 here.